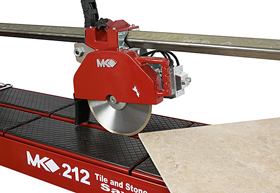 The MK-212 Professional Tile and Stone Saws are built rugged and portable for use on any jobsite. The powerful 2 Hp direct drive motor is fully enclosed for greater protection. 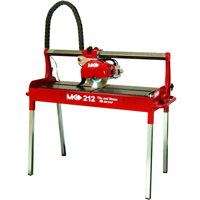 The adjustable built-in miter system allows cuts at all angles from 45° to 90°. The plunge cutting head has a pivoting blade guard for easy blade changes.